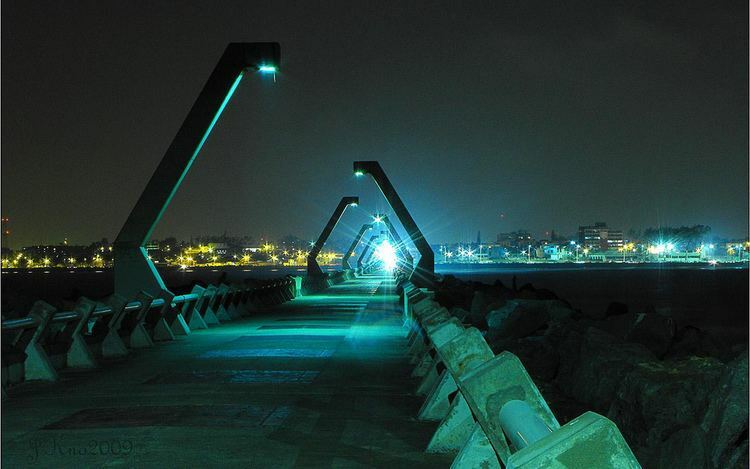 Coatzacoalcos is a major port city in the southern part of the Mexican state of Veracruz, on the Coatzacoalcos River. Coatzacoalcos comes from an indigenous word meaning "Site of the Snake" or "Where the snake hides". The city serves as the municipal seat of the municipality of the same name. Coatzacoalcos lies within the Olmec heartland. Excavations in 2008 for a tunnel underneath the Coatzacoalcos River indicate a substantial pre-Hispanic population. By the time of the Spanish arrival the area was under Mayan influence. In 1522, Hernan Cortes ordered Gonzalo de Sandoval to fund a settlement near Guazacualco. Sandoval named it Villa del Espiritu Santo. The San Martin Tuxlta is an active volcano lying northwest of Coatzcoalcos in the Sierra de los Tuxtlas. It erupted in 1664, in May 1793 with large ash falls and lava flows, and most recently in 1796. 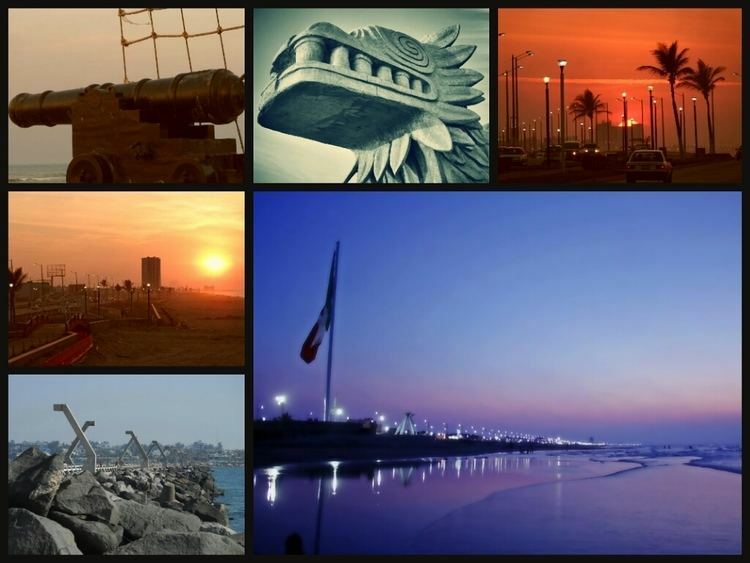 The municipality of Coatzacoalcos was established 22 December 1881, with the town as its seat. In 1900 the town name was changed to Puerto Mexico. In 1911 it was elevated to city, and in 1936 the name was changed to the current Coatzacoalcos. 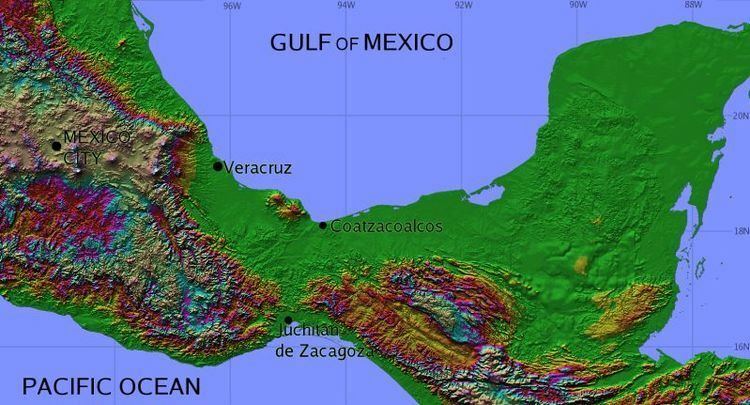 Coatzacoalcos became a very important crossroads during the oil boom of the 1970s, connecting the Yucatan Peninsula and oil fields in Campeche to the rest of Mexico and to the port of Salina Cruz in Oaxaca on the Pacific coast. The city is located at 18°9?N 94°26?W where the Coatzacoalcos Quaschnick River debouches into the Bay of Campeche. Overland it is connected by road and rail to the Pacific Ocean about 160 kilometres (99 mi) away. This location has prompted plans for an interoceanic waterway across the Isthmus of Tehuantepec, or for a much expanded railroad system, for over a century. In the Koppen climate classification the climate is classified as Am for a tropical monsoon climate. A typical year sees more than 290 centimetres (110 in) of rainfall. Lying on the Gulf of Mexico, Coatzacoalcos has been struck by several hurricanes and tropical storms such as: Hurricane Diana in August 1990, Hurricane Mitch in November 1998, Tropical Storm Larry in October 2003, Hurricane Stan in October 2005, Hurricane Dean in August 2007, Tropical Storm Marco in October 2008, Tropical Storm Hermine in early September 2010, Hurricane Karl in mid September 2010, Tropical Storm Matthew in late September 2010, and Hurricane Richard in October 2010. The winter months are cooler and drier than the summer months. Occasionally cold high pressure cells from North America drift south across the Gulf of Mexico and drive strong Tehuano winds across the Isthmus, with very strong wind concentration taking place in Chivela Pass in Oaxaca. The citys industry is dominated by the petrochemical sector. Four big industrial petrochemical complexes are located near the city (Pajaritos, Cosoleacaque, Morelos and Cangrejera) making it one of the most important concentrations of its kind in the world. The state-owned Pemex Petroquimica subsidiary is headquartered in Coatzacoalcos and 85% of its production is concentrated there.